Recently, Adrian Lozano (@giantrobo) of the Macross Speaker Podcast kindly sent me this vintage Transformers art print he found in Japan. As of this article, I have not been able to determine if this artwork was ever used on an official Transformers product. While the scene depicited is similar to what was used on several home video releases of the Transformers cartoon, it does not match any I have come across. In an effort to find out the history of this art, I am going to take a closer look at the details of this piece, as well as share a full scan of art for personal use. Please credit this article if you do decide to use the artwork. The piece is a 12 x 8 print on glossy paper. It is mounted to a piece of black construction paper with no identifying marks visible on either side. 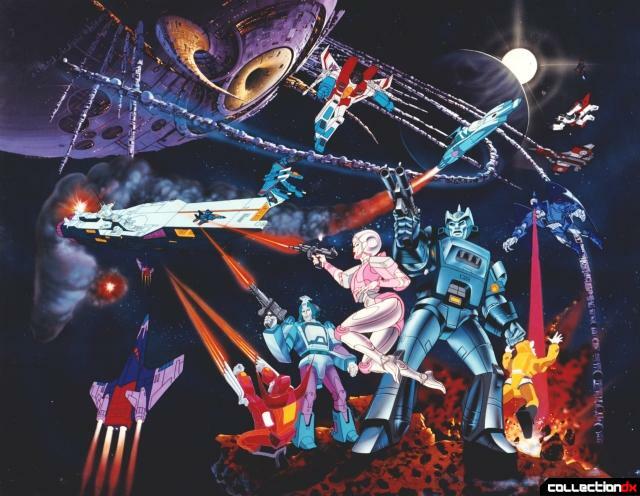 The scene depicted is a fierce battle in space with the Autobots engaging the Decepticons, while Unicron looms overhead. 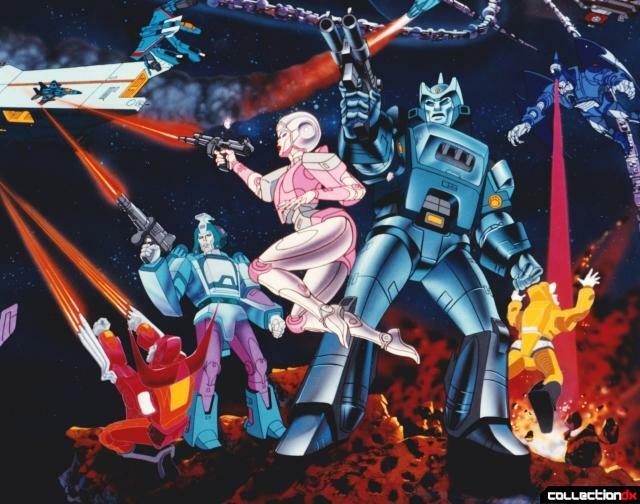 Note that all the Autobots are characters introduced in the 1986 animated film, and are drawn in the style of their early character models. Most notably, Arcee has shoulder pads covering her arms and Hot Rod has the curved upper shoulders like in early character concepts (which still appears in some Marvel comic art). 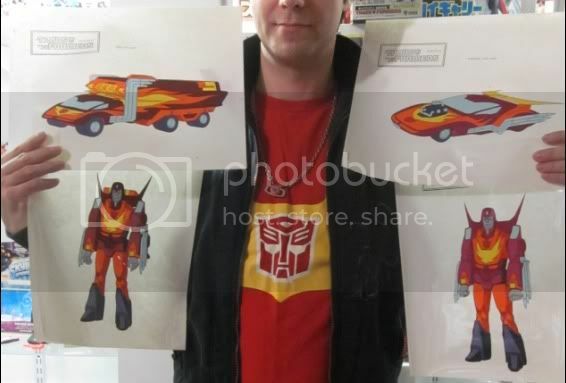 In addition, Hot Rod's spoiler is red, which matches the colorized pre-production character sheets owned by Transformers expert, Daniel Arseanault (@protoman). Wheelie is also depicted in his early colors. This leads me to believe that this artwork was produced very early in the the movie's development. Also note how both Hot Rod and Wheelie lack the heavy shading and detail of their comrades, leading me to think they were added to the scene later on. 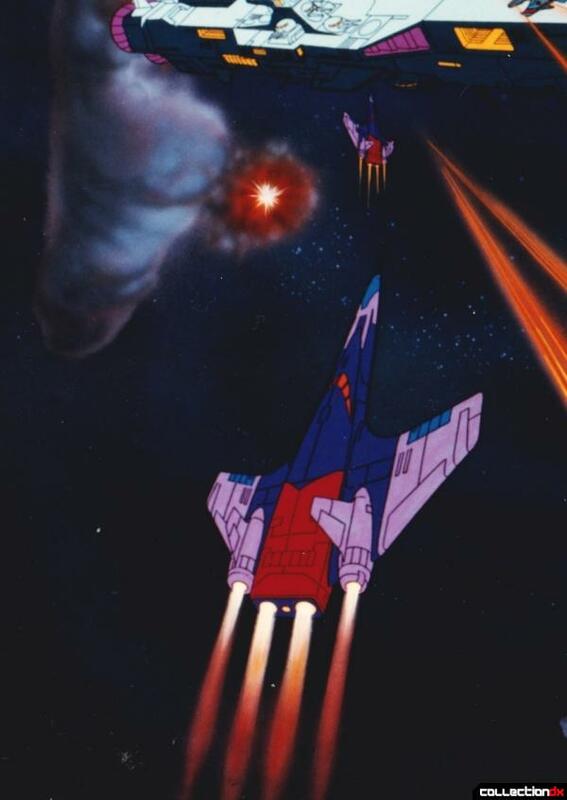 On the lower left of the scene is Cyclonus in jet mode with a smaller version above him. Both instances of the Decepticon use the same art, with the small one being mirrored. Like the Autobots, Cyclonus is in pre-production colors with a large patch of dark red along the back of his jet mode. He also lacks the detailed shading seen on the main Autobots. One of the strangest aspects of this artwork is the large space-based aircraft carrier seen being used by the Decepticon Seekers. It does not correspond to any existing ship (other than bearing a passing resemblance to Autobot Broadside), and looks more like a design out of Gundam or Macross. This may have been a placeholder design for Galvatron's ship seen in the movie. Speaking of Macross, check out Thundercracker in mid-transformation. He's looking rather Gerwalk-esque, wouldn't you say? The top part of the image features Unicron as part of the background with his planetary wings stretch all across the scene. Starscream accompanies the transforming Thundercracker or might have been meant to represent the end of the conversion sequence. The "conehead" Seekers are present in the upper right corner of the scene. Both Thrust and Dirge are drawn in jet mode, and appear to have been copied off their respective model sheets. And so that's about all I can glean from just visually inspecting the art print. I hope I have been able to provide some information as to when this piece was created and explain some of its peculiarities. If you have information about this artwork, please feel free to comment here or send me a tweet to @VF5SS. Once again I'd like to thank Adrian Lozano for passing this off to me, and ask readers to please credit this article for future reference. You can find a clean scan of the artwork here.